The CanDo Plastic Ball chair is ideal for children who have difficulty sitting for long periods of time. 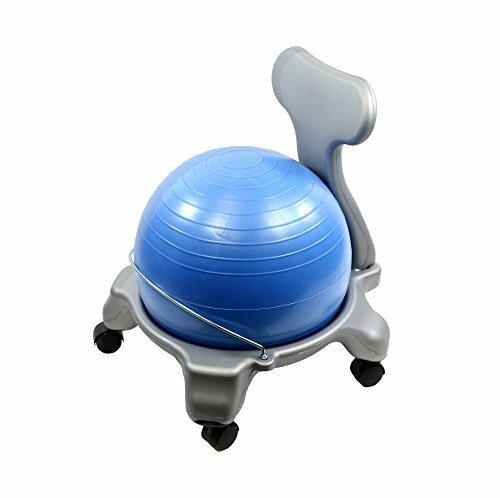 The ball chair promotes sitting in an "active" position to keep children engaged and alert during long periods of reading, writing homework, or listening to lessons at school. Continued use will improve balance, concentration, and reduced stress. Easily add this ball chair to a child's daily routine at home or school. Add more of a balance challenge by removing the removable back. The CanDo Plastic Ball Chair has a removable back and no arms. Chair includes a 15" inflatable exercise ball and chair base. The mobile ergonomic seating systems combine the benefits of ball therapy with the convenience of a chair base which holds the ball securely in place. Casters glide on carpet or hard surfaces and do not lock. Light assembly is required. Before you use the chair, you may need to inflate the ball to 70% capacity and leave it untouched for 24-36 hours. Then, deflate it completely and refill it. This will ensure the ball fits properly in the chair base.